In charge of running a special event? Want to successfully take your festival to the next level? Have a member on committee who's not a team player? 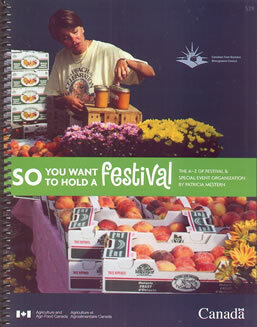 User friendly, "So You Want to Hold a Festival - The A-Z of Festival & Special Event Organization" is a must-read for organizers of festivals and special events, large and small. Pat challenges those involved in the festival industry to think outside the box; to creatively take bolder steps toward unique special event development. This comprehensive, easy-to-read handbook contains everything you need to know about running festivals and community events. Chapters cover such topics as - Choosing the Proper Event; Board Management; Building on Success; Emergency Preparedness; Rock em, Sock em Evaluation; Creative Management; Long Term Planning; Marketing & Promotion; Volunteer Management; Creative Fund-raising; Trimming the Fat. A bonus! The handbook also contains a hands-on workbook, an invaluable tool for anyone working in the festival industry. The workbook can be photocopied for all volunteers and paid staff. Before turning to full-time freelance work, author Pat Mestern spent a number of years in the Canadian festival industry, her last job as co-ordinator and administrator for a large North American festival. Today she works independently with communities across North America to develop special focus events and themed festivals; does freelance consulting for the festival industry; does freelance marketing and promotions for festivals and lectures on all aspects of special event organization. Interested in having her work with your group? Contact information is below. 555 St. David Street N.